The Hatter M adventures continue in the latest installment of the Looking Glass Wars stories: Hatter M: The Nature of Wonder. To catch you up to speed, Frank Beddor's LGW prose books detail the real story behind Lewis Carroll's Wonderland books and how Princess Alyss rose to power after her mother's death at the hands of her aunt. The Hatter M graphic novels flesh out the details of Alyss' bodyguard as he searches for the exiled princess on Earth in the mid-19th century. 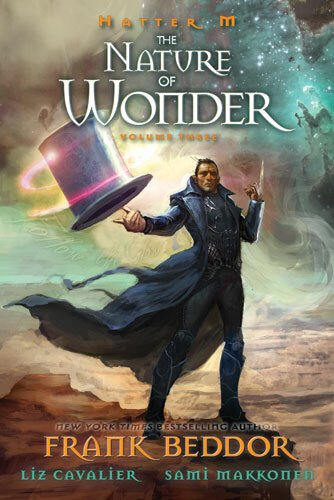 Nature of Wonder is the third graphic novel in the series and begins not long after the end of the previous book. This novel has two stories. The first concerns Hatter Madigan's involvement with the American Civil War. He was told that all secrets are kept in the White House, so he naturally heads out in search of President Lincoln. He helps ward off an attack that was helped by the proponents of Black Imagination, and garners the trust of two scientists who work at the Bureau of Illuminated Forces, a sort of prototypical X-Files agency. With their help, he's able to track down a powerful Native American shaman who is able to tap into White Imagination. In return for helping her tribe evade some potentially deadly soldiers, she provides a means for Hatter to track the stream of White Imagination which would theoretically lead to Alyss. The second story is much shorter and is a simple tale of Hatter coming to a small Western town dominated by a corrupt sheriff. Hatter discovers a Wonderland milliner who's able to repair his equipment, after which Hatter dispatches of the boorish official before continuing on his quest. This book was done by the same creative team who worked on the last one. Structurally, it seems a bit tricker, though. There are a couple of decent-sized flashbacks, one of which is woven into a mystical vision of sorts. Plus a prologue and epilogue that hearken back to the previous book, but have no direct impact on the stories here. There's some raucous action scenes, and more than a couple dramatic scene changes. Artist Sami Makkonen does an able job throughout, somewhat improved from the last book. Some of the bits aren't as elegant as they could be, but I was never at a loss for what was going on, despite some of the intentionally unusual shifts in the story. I dare say they'd give any comic artist a bit of a challenge. The stories here are tied a little more to the previous book than some of the other elements of the whole series. I think the Prologue and Epilogue especially will make little sense if you hadn't read Mad with Wonder. The main points of the story, though, are clear enough and, except where I just noted, the other books don't strike me as required reading for a new reader to follow along. There's a curious thing about these stories, too. The LGW prose books are complete with Hatter and Alyss returning to Wonderland. So we, as readers, know he's ultimately successful and in no real danger throughout these Hatter M graphic novels. But what they cleverly do here is not present a real danger to Hatter per se; they don't try to play up the drama as if he might die. There's no real question even within the book of his mortality. Instead, they use what could be those types of moments and, instead, provide insights into Hatter as a character much deeper than what is shown in the other books. That's a very interesting (to me) way of handling that type of story element. I also have to confess that I liked the greater sense of the overall continuity here. The first story is very clearly dated and tied around the assassination of President Lincoln, and the transition to the second story provides enough insight to suggest a chronological placement of the webisodes that were run online back in 2008. That continuity watching on my part probably comes from far too many years immersed in the Marvel Universe! Overall, an enjoyable read. Certainly enjoyable enough that I'm already looking to Volume 4, which is previewed in the back of the book!